Ever wondered why your child fidgets so much and if it’s something you should be worried about? Have you ever noticed how your energy changes when you’ve been sitting at your desk for a while, to when you walk to the fridge to grab a drink. This happens because moving helps us to regulate our attention. Think back to how much you learnt when your kindergarten teacher made you sit and watch how to cut and paste a picture, compared to how much you learnt by actually doing the activity yourself. Today there is more than 33,000 research papers that demonstrate the impact and importance of movement and learning. As adults we have dozens of strategies that we use every day to support us to move in subtle and appropriate ways to allow us to maintain the attention that we need to complete tasks efficiently and concentrate well. Some of us exercise, meditate, drink coffee, snack while we work, play with our jewellery, tap our feet or cross and uncross our legs. We are in charge of our body and generally our environment so whenever we feel the need to, we can stand up and move, grab a snack or change task to allow us to keep our body in an optimal state for learning/working. Just like us, kids learn best through movement too, so they instinctively find ways to help their body to attend and focus. The difference is that kids are still learning what their body likes, what works in different situations (e.g., how to concentrate when sitting on the mat v’s playing soccer) along with the rules or social expectations of the environment. For many kids, given the right environment and teachers they learn this well and can adapt their body and fidget strategies to the demands of the task/environment. For others children there are other factors to consider. poor core strength or low muscle tone makes holding the sitting position very difficult for some children and they will need to move more frequently to rest and reset their muscles. food sensitivities a qualified dietitian, naturopath or nutritionist who specialises in working with children can help you identify if there may be food related triggers. Does fidgeting have a positive or negative effect on concentration and learning? Kids are programmed to do what makes their body feel best, but what makes them feel best is not always the same as what helps them learn best. While lots of kids can listen and concentrate well by playing with an object in their hands or wandering around the room, other kids become more distracted by these attempts to self regulate. The best approach for a parent or teacher is to observe how the child is learning while they are fidgeting and how much their fidgeting is impacting on the learning, safety and comfort of others. When the fidgeting is interfering with one of these areas, then support is recommended. The better we can understand the exact cause of the behaviour the more effective the interventions can be. This is where an experienced Occupational Therapist can help. Through assessment and observation of the behaviour they can support parents and teachers to identify strategies to enable the child to either mange or overcome the fidgeting behaviours. get to school early to allow lots of time to play on the climbing equipment before school. 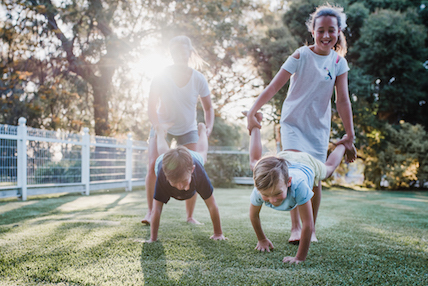 The raising children network recently release the new Australian guidelines for healthy living which suggest that kids need 2-3hours of active play per day at least 1 hour of which should be moderate to intense play like running and climbing. walk or ride to school – be sure to let the child carry their own backpack as the weight provides ‘heavy work’ into their muscles and joints which gets their body ready for learning. minimise processed foods in their diet and align as closely as possible to the Australian healthy food guidelines for portion sizes and recommended daily intake amounts as fussy eaters tend to crave foods that exacerbate their fidgeting a dietitian or nutritionalist can help support you with this. brain food, crunchy snacks and drink bottles that have a straw nose are great for supporting attention and concentration. sit and move cushions, wobble stools, weighted lap pillows, and discrete fidget toys like elastic bands or blue take when introduced with clear boundaries can also help. If these strategies are having very little impact a referral to a paediatrician or occupational therapist is recommended. Looking to learn more yourself. Try one of our online courses. Do you have a child with special needs. You might be interested in our School Holiday Adventure Camps.